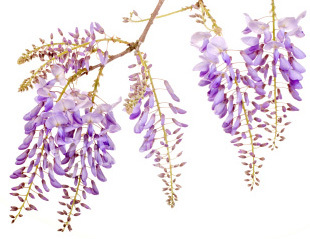 Buy Burford Wisteria Tree Vine (Wisteria 'Burford') online from UK ornamental tree supplier. Burford (Wisteria 'Burford') hails as its name implies from Burford, Oxfordshire, where it is a result of the propagation of cuttings from the Wisteria at Burford House. Its flower clusters (racemes) which combine lilac-blue and purple are very long, up to 1 metre in length (approximately 4ft) and heavily scented. Burford is a very vigorous variety and suitable for a wide range of situations. Burford is supplied at a height of between 1.0 metres and 1.25 metres in a 3-7 litre container for year round planting and better results than from either bare-root or rootballed stock. Wisteria in general are relatively disease free with mildew being the occasional problem. 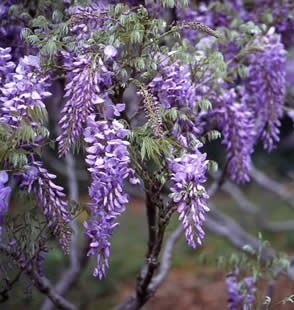 Although Wisteria tree vine can be used to be grown against a wall, trellis etc, it can also be used as a specimen tree (stand alone). For the more adventurous you can even train it as a shrub. Pick the spot where you want it to stay with care as these can be transplanted but can take a few years to recover fully. While we get more pictures of Wisteria, you should know that these are very popular for planting against walls for a highly decorative effect. The vine stretches out across walls or whatever support you provide giving great splashes of drooping colour. To train as a tree, prune back all the vines except the strongest. Stake it and train to grow upright. Once it has reached the desired height then prune out the tip growth. It will grow as a tree from this point on. Keep a close eye on young shoots growing on the main section you want as a trunk and pinch them off. You can prune hard in the trees dormant months of November, December, January, February and March. This is where you prune the main leaders and branches to control ultimate height/shape whereas other light pruning any time of the year should be to maintain shape or remove dead/diseased vine. These vines can do much better without human intervention. Over watering and feeding can reduce flowering but if you think they are obviously lacking vigour with wilted and off colour leaves then feed a rose type plant food around late winter or mid-spring. An older plant that is not flowering could benefit from root pruning in Autumn providing a richer crop of flowers in the future. You may also find that lower growing vines that reach the ground propagate themselves and start growing a new root system. Our Burford Wisteria vines are supplied with 4 year old roots.